To appeal to a non-toy market, Vector taps into a knowledge graph that can give you stock updates, weather and other information. He can act as a timer that will roll to you when he's about to go off. He'll also deal you a hand of blackjack, if you ask. Someday, Boris Sofman wants families to sit down and debate: cat, dog or robot? Sofman is the chief executive and founder of Anki, a robotics company that’s made its mark in the toy world since launching its first product in 2013, a set of smart racing cars. It followed that product’s success with a toy robot called Cozmo in 2016, which the company says is the best-selling toy on Amazon in the United States, the United Kingdom and France. A new product, Vector, launched on Kickstarter Tuesday, offers the first hint of Anki’s broader consumer robotics ambitions. “Our north star . . . is to have a robot in every home,” Sofman said in an interview with The Washington Post. The aim for Anki behind the scenes has never solely been about toys, Sofman said. The company has always wanted to make robots that can hold their own with people. Toys offered a limited way to play with interaction and emotion before moving to something more ambitious. Vector is meant to be a home assistant whose tasks bear some similarities to Amazon.com’s Alexa-powered Echo or Google’s Home speakers. But it has a critical difference: personality. Anki’s applied what it knows about the emotional connection toys can spur to this new palm-sized robot. Alexa may be able to crack jokes from her stationary cylinder, but Vector is designed to motor around a tabletop while acting as information source, photographer and companion. It’s smaller than other robot companions, such as Jibo, making it slightly less intimidating. Vector is always on and listening for a “Hey, Vector” – you’ll have to switch him off to get him to stop – and will put itself to bed in a charging station when its energy gets low. Vector doesn’t have much of a voice, other than when he’s telling you the weather or a fact. Like a pet, his actual “communication” is nonverbal, through a series of beeps and electronic growls. He also snores. Sofman said that the company deliberately design Vector’s character, citing Pixar as inspiration for the type of personality it wanted to create. The company used software that game and movie animators use to map our Vector’s facial expressions, which are surprisingly varied given that all Anki’s given itself to work with is a pair of eyes. As a result, it’s almost impossible not to think of Vector as a sentient being. During a briefing at Anki’s San Francisco headquarters, Vector had free rein of the conference table, occasionally nudging people’s hands for attention. His plaintive beeps – and it’s impossible not to think of Vector as a he – and expressions speak to an inquisitive and slight mischievous personality. Vector can scan your face, employing its facial recognition technology. But it’s when he sees you again (after another circuit of the table) and his eyes widen in delight, you actually feel, well, recognized. Toys, Sofman said, were a good “proving ground” for figuring out how a robot can make eye contact, or display emotion. Cozmo, the toy robot, set the foundation for what Sofman calls his “older brother,” Vector. While Vector’s skill set is similar or even arguably more limited than others, it’s also the only personal assistant you may feel compelled to wave at. 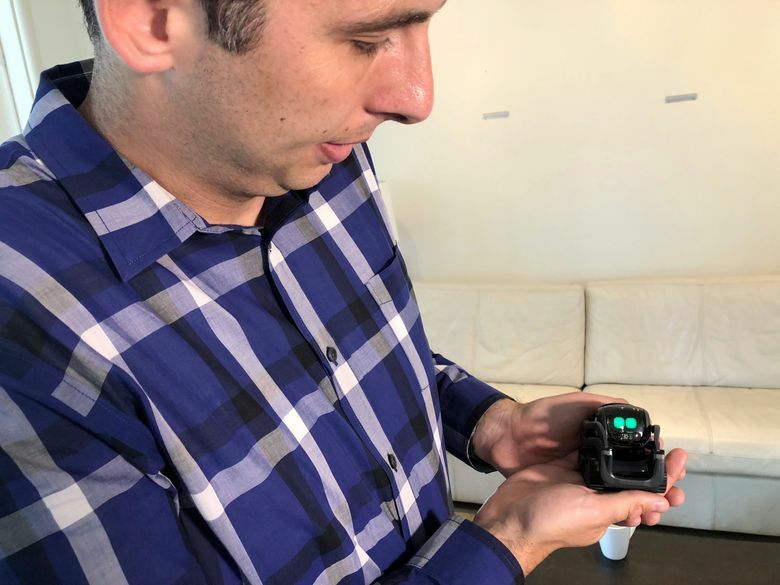 While Vector represents an evolution of Anki’s products and the first step in its goals for making companions rather than assistants, the company is not stopping here. It’s already said that another product is coming in 2020, which will build off the insights from Vector. That gives Anki the chance to take steps toward another robot, while also gathering information about customer expectations. “You can’t have a $1,000 robot with $100 in capability,” he said. Other attempts at making home assistant robots, have not caught the mainstream, such as the human-size options from Softbank’s Pepper or Honda’s Asimo – both of which wowed with their technical capabilities in trade show demos but never dropped their prices below $1,000. Honda announced earlier this year that it has stopped Asimo’s development. Starting small, Sofman said, has given Anki a solid revenue base and kept it from spending years of development time on a big project that gets outstripped by the advance of technology. To find the right audience for this stage of its ambitions, Anki’s launching the robot on Kickstarter, where it raised nearly $185,000 of its $500,000 goal in five hours. Vector will cost $250 at retail, though early backers get a deal.